So, just what are the top HR priorities of 2019? What opportunities and challenges will HR teams face this year? How can HR teams stay on top of these changes that are going to be happening? In this blog, we’ll be taking an in-depth look at Morneau Shepell’s recent Trends in Human Resources survey to discover the top 4 priorities that you, as an HR professional, could very well address in 2019, and offering suggestions on how Workplace by Facebook can assist you in addressing and meeting these priorities. 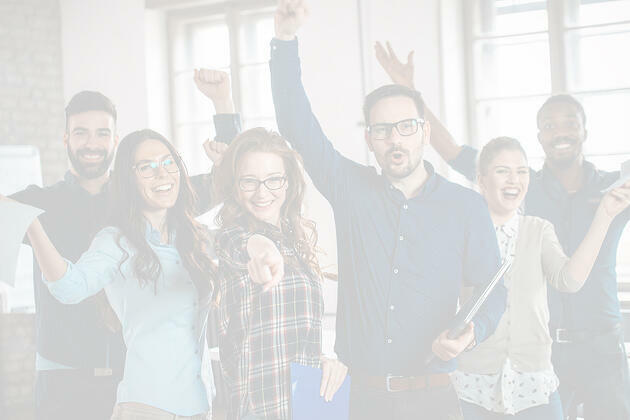 According to the survey, 67% of participants saw improving employee engagement as the top priority for 2019. And it’s no wonder why – a recent Gallup Poll showed around 85% of employees classify themselves as either “not engaged”, or “actively disengaged” at work, and other research shows that an actively disengaged employee costs their organization $3,400 for every $10,000 of their salary! Of course, when you google “How to Engage Your Employees”, there are several potential options that come up, with involving your employees, providing feedback on performance, thanking them, creating a productive work environment, and being transparent as five of the top suggestions. Workplace by Facebook, with its many features and its high adoption rate, can certainly help your organization engage and encourage your employees. 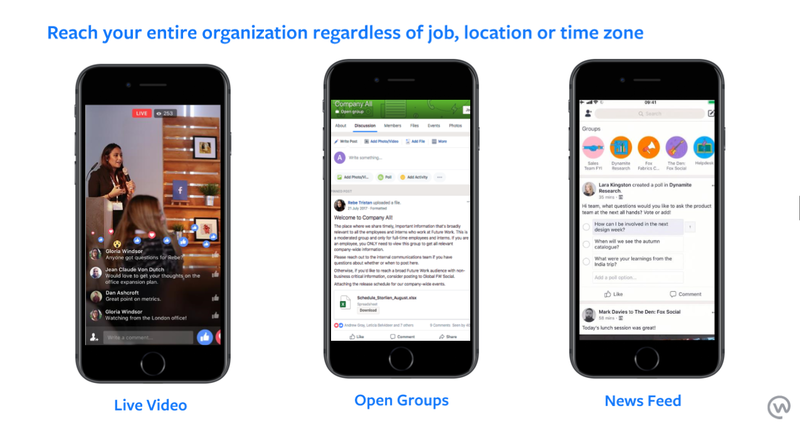 In fact, Workplace by Facebook’s collaborative platform is ideal for getting employee engagement through creating posts, polls, videos, and important company updates in minutes. Your employees can respond in real-time, making it easy for them to speak their mind and feel like a part of the team. Want to thank your employees? Create a Workplace “Internal Kudos” group and let the compliments flow! Want to provide feedback on performance? 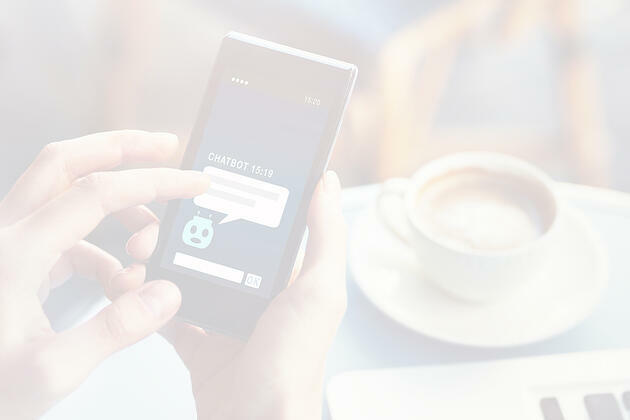 Chats and private groups can be used to track those important one-on-one conversations that you want to have with the employees that report to you. There are lots of ways that Workplace by Facebook can help you engage your employees. The workforce is changing, and with the influx of Millennials on the scene, job-hopping has become much more commonplace than it ever used to be. In fact, a recent Gallup report pegs 6 out of 10 Millennials are open to new job opportunities, and millennial turnover costs the U.S. economy $30.5 billion annually. So, it’s no surprise that Morneau Shepell’s research shows that 59% of survey participants identified attracting and retaining employees with the right skills for the job as their top priority for 2019. Of course, better compensation and benefits is the number one reason why people leave their jobs for another one. But, according to IBM’s recent Should I Stay or Should I Go? 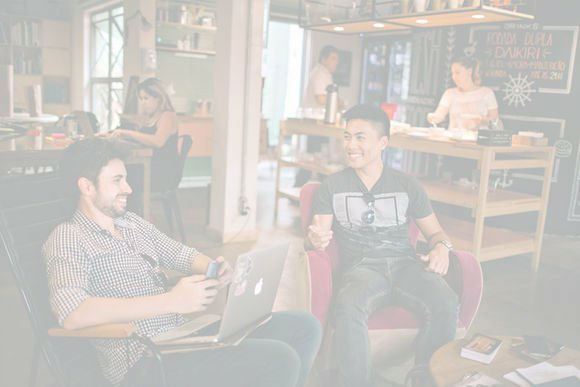 whitepaper, 74% of Millennials and 68% of Generation X’ers mention better career development opportunities as another significant reason to leave their current job, followed closely by whether or not the new organization has a better employer brand. 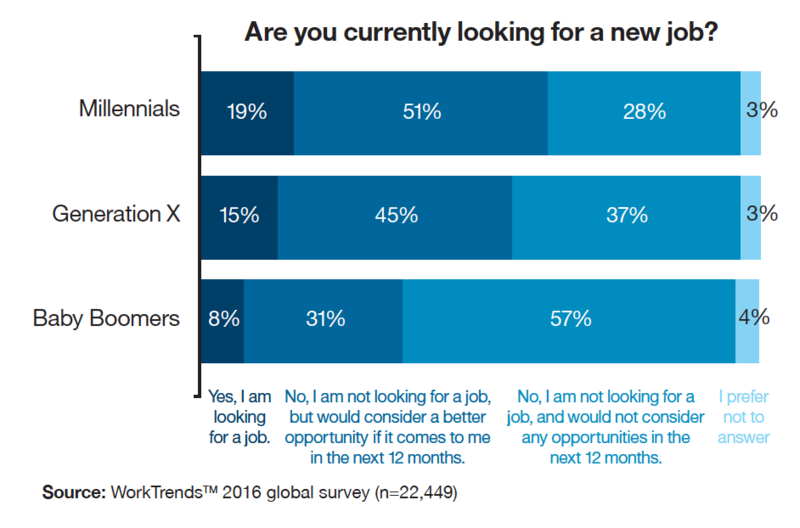 Flexibility at work was also quite high, with 64% of Millennials and 56% of Generation X’ers mentioning this as a reason to leave their current job for another. So, how do you attract that top talent to your organization, and, once hired, how do you ensure they stick around? Given the fact that your organization’s brand as a great place to work is a significant game-changer in attracting new talent, take some time and build up your brand! A solid corporate culture that both challenges and supports your employees can be done by implementing amazing collaboration tools like Workplace by Facebook. Workplace can provide an open platform to allow your employees to stay engaged with what’s going on in the company, express their opinions on how things are being run, suggest changes they’d like to see, arrange social gatherings with their colleagues after work, and much more. Humans are often predisposed to hate change. The present situation, even if not ideal, is familiar to us, and we therefore deem it ‘safe’. Even if the change that’s being proposed is a positive one (for example, implementing a new system that will make our jobs easier), we are, psychologically, predisposed to balk at it. Especially when this change is thrust upon us with little warning, which can easily trigger anxiety and stress. Communication, Communication, Communication: Continuous communication is important in any relationship, including work ones. When introducing a new change to your organization, your communication process needs to be more than just a few sporadic emails. A schedule of announcements that start several weeks (if not months) before the change should help. Holding Activities: Opening up two-way communication is highly recommended. By allowing your employees to ask questions, provide their input, and feel that their voices are being heard, you can ensure that your employees are more open to the idea of change. Holding Lunch & Learns, Town Hall Meetings, or other such interactive activities can really go a long way in making your employees more comfortable with the changes that will be happening. Answering “What’s In It for Me?” Questions: Change is easier to digest when you can truly understand the benefits for that change. Your employees are far more likely to get on board with the changes you want to make in your organization when they are shown what’s in it for them. FAQ Sheets/One-Pagers: Change is bound to come with some questions. Start with a focus group of employees and see what questions they’re asking, then put together FAQ sheets or one-pagers, and make them available to your employees both before and after the change is implemented. A change management process should encompass several, if not all these ideas, and Workplace by Facebook is the perfect platform to facilitate change management in your organization. Known for the ability to get instant, real-time feedback, Workplace by Facebook is all about communication and collaboration! Group chats, polls, and comments can provide you with an instant pulse of how your employees are feeling. Or, tap into Workplace by Facebook’s video conferencing capabilities and host meetings with up to 50 people at one time – focus groups, anyone? Learning and development programs take your employees from what their current performance is to what their potential performance could be. So, it’s very important to consider improving solid learning and development programs within your organization. Morneau Shepell’s survey shows 50% of HR leaders have placed an emphasis on improving learning and development programs as a top HR priority for 2019. When an organization invests in the professional growth of their employees, and takes the time and effort to offer learning and development programs or training, it shows the employee that the organization has a vested interest in helping them progress in their role, and potentially move to other, more senior roles. This is likely to lead to higher job satisfaction, which, in turn, can lead to lower turnover rates, more employee loyalty, better customer service, and higher revenue. You may not think of Workplace by Facebook as a learning and development platform, however, this versatile, multi-functional tool is definitely capable of helping with employee training. 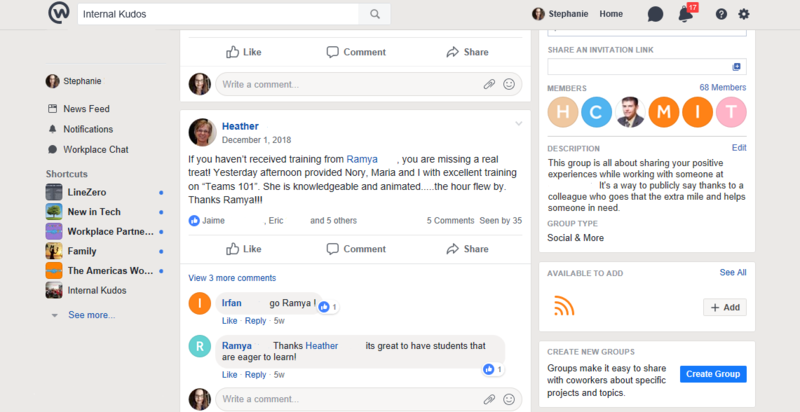 From creating private mentor groups and matching mentors to mentees based on their interests, to adding training videos in one place, to hosting live demos and training calls, Workplace by Facebook’s collaboration capabilities are a great way to keep track of and facilitate learning and development across your organization. Let Us Help You Get Your HR Priorities of2019 Straight! With the launch of Workplace for HR, and the emphasis on the collaboration and communication capabilities of this amazing platform, it’s clear that Workplace by Facebook can be a vital tool in helping HR professionals to address some of the biggest priorities for their organizations. Workplace by Facebook is a versatile platform that, when implemented in your organization, will provide you with a collaborative environment that encourages feedback and growth. At LineZero, we live for helping HR professionals, just like you, to get started using Workplace by Facebook. Our experienced team is capable of discussing how Workplace by Facebook can make your HR priorities become a reality. Questions about how Workplace by Facebook can help your organization? Want to explore what it looks like for you? Contact us today and see how we can help!